Preserve chicken in "TERIYAKI SAUCE" for 30 minutes. Grill chicken for 15 minutes by oven 220℃. When it gets cooked through, spread "TERIYAKI SAUCE" on the chicken. Grill it by oven again. 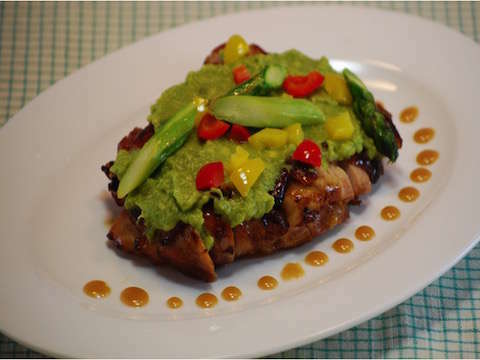 To make avocado sauce, peel avocado and cook it by microwave oven. Mash the avocado with HANJYOTEN GOMA sauce. Cut paprika into dices about 1cm. Peel asparagus and cut it. Spread olive oil on paprika and asparagus, cook it by microwave. Dish it up with paprika, asparagus and special avocado sauce.